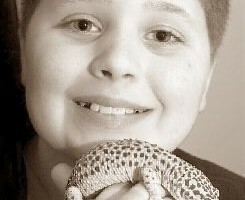 It’s not hard to see that Daniel S, who adores his pet gecko, Gex, came into this world to make a difference. Here is a smart, chatty boy with a mission to rescue an endangered creature. Maybe it’s because for a time, he too, was on an endangered list.